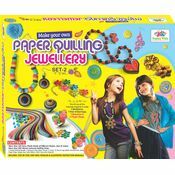 quilling to be creatively satisfying and fun. 1 adhesive tube, Satin strips, Google eyes. Detailed and very well illustrated Instruction Sheet. 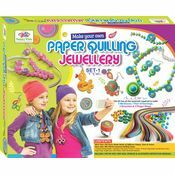 Paper Quilling is the art of rolling, folding, twisting or otherwise shaping thin paper strips to create beautiful designs. 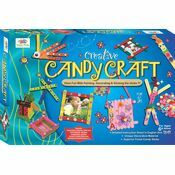 Kids can use this beautiful craft in almost any of their projects. 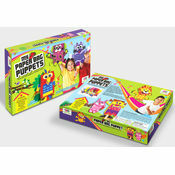 It encourages their imagination and exploration. Also it develops their fine motor skills, patience & diligence, boosts their creativity and gives them a sense of accomplishment. 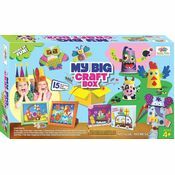 In this kit we are providing all the material required to create- 3 Greeting Cards, 2 Door Hangers and 1 Wall Art which you can showcase. With a little practice, one will find quilling to be creatively satisfying and fun. 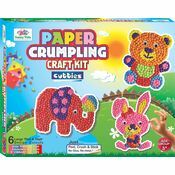 CONTENTS: 6 Art Cards with Preprinted Themes- (3 Greeting Cards, 2 Door Hangers & 1 Wall Art) , 450 quilling strips in different sizes and colours, 1 Crimping tool, 1 slotted quilling needle, 1 adhesive tube, Satin strips, Google eyes. Detailed and very well illustrated Instruction Sheet.